Yeh un dino ki baat hai jab log pura hafta Naukri, College aur Dhande me nikal dete the aur Weekend ko theatres me Veere Di Wedding dekh k, apna katwa lete the aur phir wahi Naukri, College aur Dhanda. 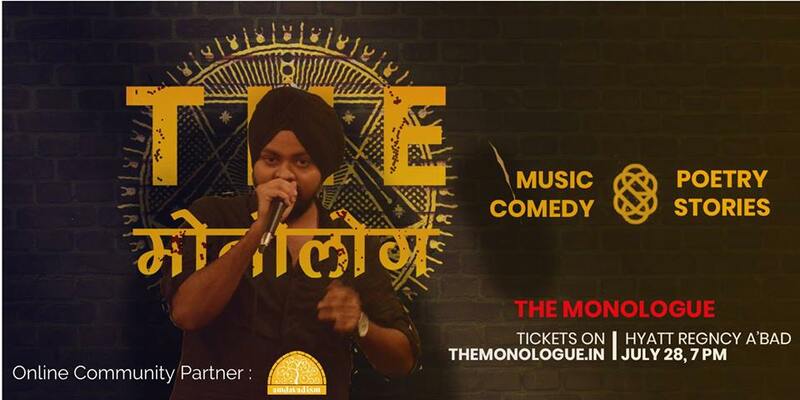 Weekend pe open mics k options aise badal rahe the jaise kachhe badal rhe ho. Ahmedabad bade sankat me tha saheb. Is event me going ya interested kardo ham batayenge Ahmedabad ko is sankat me se kaise bacha sakte h.
The Monologue is gonna continue its trend by coming up with yet another entertainment show in the premium ambience of Hyatt Regency. Every time it has not failed in mesmerizing you with the wonderful set of performers and we are pretty sure you’ll not get disappointed even this time. Log jyada hai ticketa kam hai. Jaldi book kardo warna Prasad bhi nahi milega.